The PC market has been in bad shape for several years. While the why is up for debate, it certainly wasn't helped by two disappointing versions of Windows in a row -- 8.x and 10. Not to mention, hardware lasts much longer these days, as performance has long surpassed the needs of many consumers -- the concept of needing to upgrade a PC every two or three years is dead. Hell, many consumers can get by with just their smartphones and tablets -- a traditional PC just isn't as necessary as it once was. 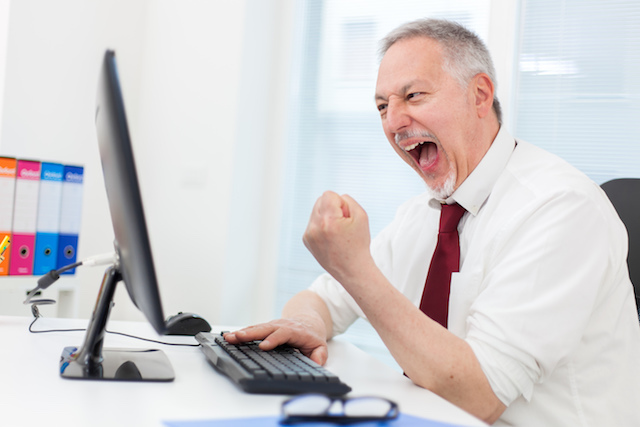 Shockingly, according to IDC, the PC market could finally be on the road to recovery. While the market is still very unhealthy overall, there is one stat that signals something special could be on the horizon. You see, for the first time in six years, the worldwide PC market saw a Q4 increase year over year. In other words, Q4 2017 outperformed Q4 2016. This is particularly significant, as both Christmas and the holiday shopping season are in these months. "The 4Q17 results further validate the view of a steadying, albeit still weak, traditional PC market, buoyed mainly by commercial upgrades and pockets of improving consumer PC demand. 2017 ended with an annual shipment volume of 259.5 million units, which represents a year-over-year decline of 0.2 percent. This makes 2017 the most stable year the market has seen since 2011," says IDC. The company also explains, "Aside from commercial demand, 2017 was further helped by several other factors. Although the situation improved as the year progressed, the shortage of key components such as SSD (Solid State Drives) acted as a major driver of shipments for much of 2017, with top PC companies vying to lock up supply ahead of price increases and thus boosting orders. In response to the contracting tablet market, companies also returned their focus to the notebook market, shifting the product mix to appeal to key user segments and expanding the number of slim, convertible, and gaming systems." As you can see, not all computer manufacturers saw Q4 YoY growth. In fact, amongst the top six companies, only three of them were positive -- HP, Dell, and Apple. Surprisingly, even with other manufacturers such as ASUS, Acer, and others struggling, it was still enough to show positive growth. 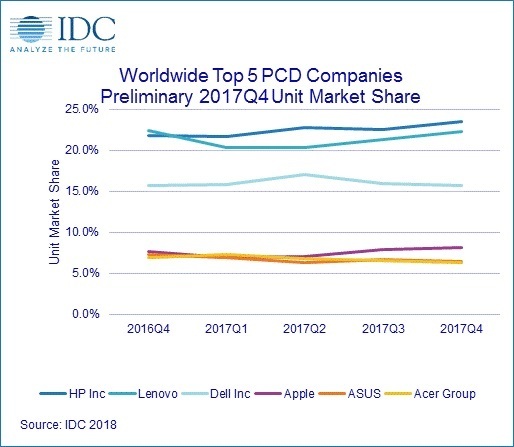 * IDC declares a statistical tie in the worldwide traditional PC market when there is a difference of one tenth of one percent or less in the share of revenues or shipments among two or more companies. True, growth of less than one percent for the entire industry when only comparing two quarters is not much of a win, but it is still a win nonetheless. Not to mention, with Meltdown and Spectre impacting most computers in use, there is a good chance we could see even larger growth due to consumers upgrading to more secure hardware over the next couple of years.